The kaitenzushi (conveyor belt sushi) business is a fierce one with chains unleashing gimmicks left and right to compete. Kappa Sushi is one such competitor having set up daring promotions such as the Sushi Cake, All-You-Can-Eat Sushi, and rock-bottom 50 yen sushi. 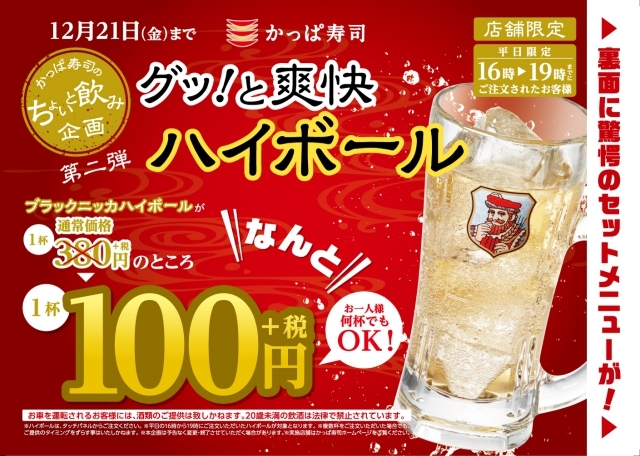 Kappa Sushi is now selling highballs of whiskey and soda for just 100 yen from the hours of 6 p.m. to 9 p.m. Since they normally sell for 380 yen that’s a considerable bargain, and it’s not even limited to one per person, so get as many as you like! However, if that’s still not enough of a discount, Kappa Sushi also humbly offers a pair of combos as well. 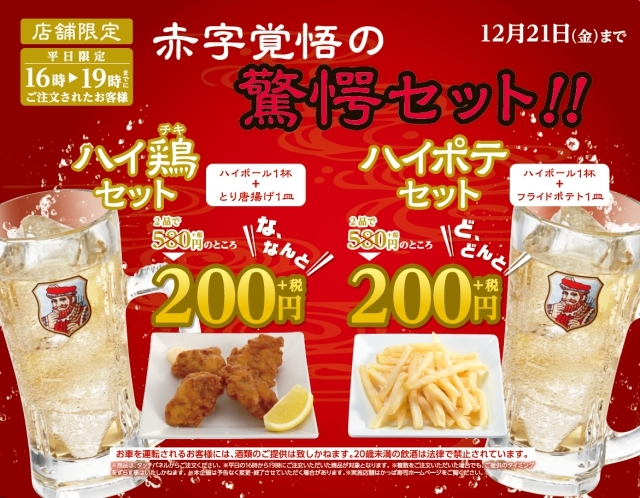 The High Chiki Set is a dish of karaage fried chicken and a highball while the High Poté Set has French fries in the place of the chicken. Each combo is only 200 yen. These combos normally cost 580 yen, so if you crunch the numbers you’ll find that even if you buy two, you’re still saving about 30% on the price of one! Now for the bad news: this offer is only limited to Kappa Sushi locations in Tokyo, Kanagawa, Aichi, and Osaka Prefectures. Also, it lasts until Dec 21. Still, it’s a great deal, and did we mention they have sushi there too? not really- that's for 1 piece of sushi. Hamazushi has 2 pieces for 90 yen on weekdays. That highball is probably so watered down that you might as well be drinking nothing. That's just NASTY! It is incredible how low Japan has sunk! Sushi in these cheap joints is not very good & now offering cheap drinks made from those 5L plastic bottles of lousy "whiskey"
"That's just NASTY! It is incredible how low Japan has sunk!" 'Smatter, GW, ya don't like fried chicken and highballs? OK, so the whiskey in these highballs is not good bourbon, but hey, for only 200 yen... lol. "Sushi in these cheap joints is not very good"
Ain't nuthin' wrong with the 108 yen bintoro at Kurazushi. Way better than anything at McD's, lol. You need to try some better quality joints where the booze & food isn't borderline poison LOL!!! I will take quality over quantity any day!